Sometimes I look at the subject of a coin and think, "Surely that's one of a kind. I would never find THAT on any other coin!" Normally such a subject, by its very nature, could never appear in a thematic topic, because it is unique. But I thought it would be fun to have a theme devoted to unique subjects: a sort of anti-thematic theme. There will have to be some rules, but they will be flexible, since it is meant to be a fun topic. 1. The topic will be restricted to machine-struck coins only, because it would be all too easy to find a subject on a token or a hammered coin that would never appear on a milled coin. 2. By "coin", I mean an authorised coin issued by a recognised state or by a de facto state. Transnistria, for instance, is a de facto state, so its authorised coins would count. Coins can be standard circulation coins, commemorative coins that circulate, or commemorative coins that do NOT circulate (collector coins). Fantasies, patterns, trials, probas, essays, etc., are not allowed - that would make it too easy. So, that means no pieces from the Andaman Islands or "Atlantis"! Bullion coins are accepted if they meet the other criteria. 3. Human individuals do not count as unique. This is because it is highly likely that there will be only one coin in the world showing a specific Transnistrian hero, and that coin will be from Transnistria (or maybe from Liberia or the Isle of Man - but you see my point). 4. Generic types of animal count: e.g. if only one coin shows a tenrec, that counts. However, if someone says, look, this is the only Carcharodontosaurus on a coin, I would say, yes, but it's not the only dinosaur. So some leeway and common sense are called for. 5. If one member posts a subject he thinks is unique, but another member can prove that it isn't, that coin, and the comments on it, will be moved to a topic called: "One of a kind: rejections!" 6. Some subjects or rules will not be clear-cut. If you disagree with a post, give your reasons. After enough members have given their opinion, I will make a decision based on the consensus - even if the consensus goes against my own opinion, because this is meant to be fun. One of a kind: Rejections! This is a coin commemorating the Argentinian author Jorge Luis Borges. I do not have a high opinion of that genre (Borges, Beckett, Pinter, etc. ); I am simply interested in the maze that appears on the reverse. Presumably it figures in one of his fables. You often see a maze in the garden of a palace, but I think this is the only maze on a coin. Can anybody prove me wrong? The only kinkajou I have seen on a coin appears on this gold coin from Belize. So let's leave the maze there, at least for the time being. Here is another theme that could be unique: a ballpoint pen. You've chosen a theme or concept that it is difficult to assess. 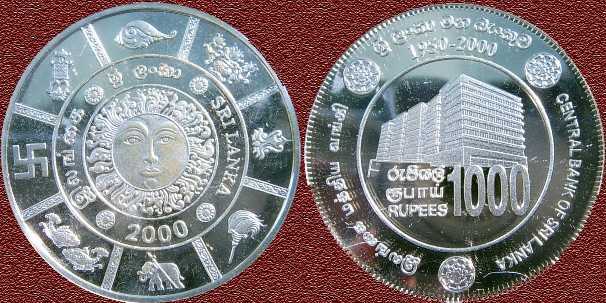 What about this Sri Lankan coin (left-hand side)? Uruguay, 2 pesos, 2011. This is the only capybara to have appeared on any coin, I do believe. United Arab Emirates, 1973, 1 dirham. Arab coffee can. Any more coffee cans? Mozambique, 20 meticais, 1980. I am certain that this is the only armoured carrier on a coin in the whole of the known universe. Latvia, 2011. Surely the only beer glass on a coin. Czechorepublikia. The only brewery on a coin? So yes, the mahavir coin is hard to assess... But for the moment in my mind it fits well as a "one of a kind"
British forces currency in Afghanistan, issued 2004. Force Protection patrol exiting Shaibah Log Base, Iraq. Apr 04 issued 2008. An Act of Parliament in 1775 required that all coin weights be submitted for examination because there were many irregularities found, an examination mark of a ewer of the Founders Company to be used within a radius of 3 miles around the City of London. This stamp was more commonly known as a coffee-pot.